Where did this idea come from in the first place? Why a meeting management solution? A few years ago, I went to so many meetings that I thought it was a waste of time. Indeed, a meeting confirmed my thoughts. I’ll tell you about it. I was invited to attend a product launch meeting where I was the main topic of the meeting. So I was prepared: my speech was ready, I knew the purpose of the meeting and above all, I knew why I was there! However, for my chair neighbor, it was a completely different reality. Let me explain. When he arrived, he asked me if I knew why I was there. Innocently, I told him no, I did not know why I attended this meeting and, to my surprise, him either!! He even told me that to make sure he didn’t miss anything, he invited his colleagues to also join the meeting, just in case! At that point, I realized that people were not involved, did not know why they were meeting, were unprepared. Of course, the project did not achieve its objectives. This is a common case, which happens so often in the organization. Deep inside, I realized that we needed to help companies better manage their meetings, to achieve operational efficiency. At first, I thought that Voxlog could be the ideal tool to help me prepare and hold more efficient meetings. However, Voxlog is a recording tool with added notes and in this case, I needed a note tool that could be used as a recording tool to improve our statements. Beenote was born from these early days to get to be at what we know today. A meeting management solution that provides a pre-established agenda and minutes structure and that provides an audio recording in addition to a variety of other features. What are meetings for Beenote? We like to hate meetings, but they are there to stay because they are important, even essential to the progress of projects, to make decisions or to share information. The important thing about meetings is not quantity, but quality. If they are better planned in advance, they will be more productive when they are held and people will spend less time in the post-meeting to complete the minutes. At least 20% of time can be saved using a meeting management solution. Why does the bee represent Beenote? What is the link with meetings? As you may have noticed, the bee is Beenote’s emblem. It’s no coincidence, you know. The bee is an insect that functions in a group, with a very precise hierarchical level with established tasks and roles. Each of the bees is useful, each in its own individuality, allows the group to move forward, to build the hive, to collect the pollen, to finish, to reap the fruit of their effort: honey. We can therefore easily draw parallels with the workplace and corporate meetings. What types of meetings do you hold? At Beenote, the types of meetings have evolved with the product because we are a startup. Initially, we held brainstorming meetings to develop the product, brainstorm ideas, share ideas and test it with targeted groups. Subsequently, there project management meetings: problem-solving, validation, solution proposal, and deliverables meetings. Now that the product is mature, we hold weekly information meetings between different departments to inform others on the progress of our respective tasks, a little in the scrum style. We also have weekly meetings by department to discuss, exchange and make decisions on next steps. How is a typical meeting held at Beenote? Meetings at Beenote take place in 5 essential steps: Schedule management, agenda planning, holding the meeting minutes writing and task completion. At Beenote, we use Google Calendar integration (Microsoft Office 365 integration is also available) to determine the schedule of unplanned meetings. Over time, we agreed that it would always be the same time slot to facilitate schedule management and make it easier for people to prepare in advance. The invitation, made by the leader, is made 3 days before the meeting to allow all participants to collaborate on the writing of the agenda. The role of the meeting leader is to take the initiative to create and take charge of the entire meeting process. Ideally, it changes at each meeting to allow each teammate to feel involved in the team and be active during the meeting. As Beenote’s team is small, for us, 3 days are more than enough time for each partner to document the topic they consider relevant to share with everyone. 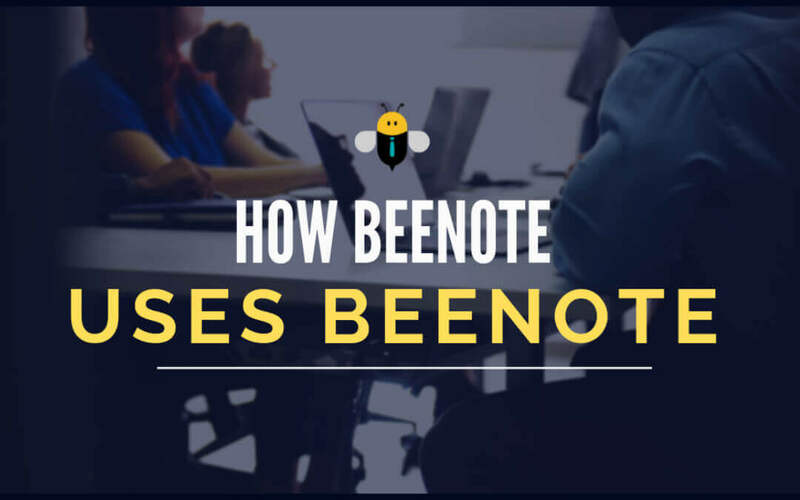 Beenote is a collaborative working tool. Each partner completes his topic on the agenda. He indicates, on this topic, the objective (inform, exchange, generate ideas, consult or decide), the person in charge (himself and the other people that it may be concern, we even may invite a teammate for a specific topic only to attend), the relevant documents to be presented and that will be kept in the minutes registry as well as the estimated time for this topic. When the partner finishes his topic, the overall meeting time is automatically adjusted in the calendar of all. The agenda of the meeting also remains in draft form until the leader confirms it and the meeting is ready to be held. At the very end, with this agenda, we created a template that we use for future agendas. At Beenote, we also alternate the place of the meeting to change the routine. Sometimes the conference room, another time the operations room or the president’s office! Before officially starting the meeting, it is important to determine the note taker. Ideally, he is not the leader of the meeting, because it is very difficult to do both tasks at the same time. We also alternate this task from one meeting to another. All arrive early in order to respect the time allocated and bring their laptop or smartphone to follow the evolution of the agenda. In the conference room, we project the agenda so that everyone can view it in real time, as well as to project videos, URL links or other relevant documents to present to participants and guests. It can happen that someone is teleworking. At the scheduled time, he can follow and collaborate on real-time note taking. In addition, if he wants to see the participants, he can use, at the same time as Beenote, a video conferencing solution such as Zoom. The leader makes sure that the agenda items are followed. He is the link between the various stakeholders and ensures that the time is respected. A sound indicates when the time is over for the speaker. The note taker writes directly into Beenote everything that is relevant to add to each topic. He assigns tasks to the right people, records and indicates the decisions that are taken. We use Antidote to correct the spelling in real time. All partners, meaning those who are responsible for a topic, can also add details to the notes. Each participant takes his personal notes directly in Beenote. External guests use their own tool or bring a notebook and pencil for the more traditional ones. At the end of the meeting, we determine the leader for the next meeting to be responsible for the entire process of the upcoming meeting. The meeting leader (or one of the partners) is the one who completes the writing of the minutes and sends it to all participants as quickly as possible. Once the note-taking has been done during the meeting, he only needs to validate that everything is compliant. If the notes were taken during the meeting, it is estimated that 80% of the work involved in writing the minutes was done. Each participant receives an email notification that the minutes has been completed. It is added to the minute’s registry for future reference. Assigned tasks are also sent by email at the same time. As we still have the same model for holding our meetings, we duplicate the agenda of the previous meeting and each topic leader completes his part again. The approval of the previous minutes is automatically added in Beeboard mode and manually in Beeteam mode. Tasks that have been assigned at meetings or in the minutes are automatically added to the agenda for follow-up. If there are tasks that have been assigned outside the meeting, we add them when the meeting is held with the task registry linked to the same file as the meeting. For team leaders, managers or anyone else in a management position, it can be very interesting to consult statistics on tasks, meetings and meeting attendance. Beenote is a meeting documentation tool, as it documents the entire process before, during and after meetings, allowing you to search for topics, decisions, tasks or minutes. In fact, any item that has been recorded in a meeting. We search by keywords in order to easily find what we are looking for. Beenote is a complete tool that greatly helps us to improve our process. Melanie is the Marketing Digital Specialist at Comnet Technologie who handles design, content, user experience, and all marketing for Beenote. Melanie helps individuals, teams, and organization to adopt good meeting practices.